His Sisters Sharon(Alex Strongarm) and Alice Sangwais. Brother in Law Lorne (Anita) Sister in Law Vera, Lynda and Hilda. He is also survived by numerous cousins, nephews, nieces, and friends to many mentions. Michael was predeceased by his parents John & Dorothy Koochicum(Starr). Grandparents Charles and Minnie Koochicum. His loving wife Stella Beatrice. In-Laws Charles and Florence Bigknife. Brothers: Robert, Darrel, Clarence. Sisters: Delbina, Doris, Muriel and Leanne Starr. Brothers in law: Richard McNabb, Clayton Watson, Mervin Bigknife. Sister in Laws: Patricia Koochicum, Angie Starr, Anita Starr. Nephews: Bradley Koochicum, Will Koochicum, Paul Tuckanow, Terrence Starr, Jordan Koochicum, Elden Bigknife. Nieces: Leila Bigknife, Laurina Klyne. Granddaughter: Rianna Sapp and numerous other grandparents uncles, aunts, nieces, and nephews. Wake will be held on Wednesday, March 27, 2019 at 4:00 pm. in the White Calf Gym, Lebret SK. Funeral Service will be held the following day on Thursday,March 28, 2019 at 11:00 am in the same location. The family would like to thank and acknowledge the doctors and nursing staff of All Nation Healing Hospital, Regina General Hospital, Pasqua Hospital and Wascana Rehabilitation Centre. File Hills Community Health Centre, Lois Dixon & Home care Team. EMS and RGH Emergency Dept. Peepeekisis Cree Nation, Chief Frank Dieter & Council. Starblanket Cree Nation, Chief Mike Starr & Council. Okanese First Nation, Chief Mary Anne Day Walker-Pelltier and Council. 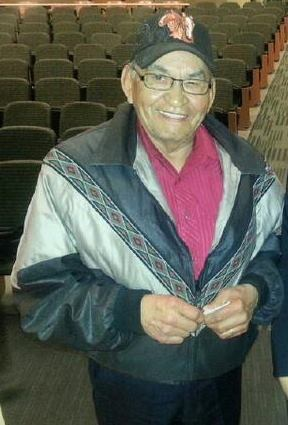 File Hills Tribal Council, Chairman Edmund Bellegarde. Anita Jackson and Sharon Desnomie. Thank you all for your prayers and kind words of comfort. Dad was an avid sports fan of the Toronto Blue Jays, Saskatchewan Roughriders and the Edmonton Oilers. He loved boxing and Stampede Wrestling , WCW, WWE, His submission move was the claw and when he applied it on us we would tap out. He enjoyed watching and playing curling, shuffleboard, and bocci ball, golf, rodeos, and chuckwagon races.